I have been dreaming of Spring since the weather changed here in South Florida to the low 40s and 50s a few days this week which is cold for us. After grabbing some great Spring color pre-cut fabric right after the holidays a few weeks ago on sale at Fabric Mart, I decided that sewing for Fall/Winter must come to an end even though we have a few months left. We do not get snow here in South Florida, but this winter, we have had a few days where the temperature dropped to the low 40s and 50s. 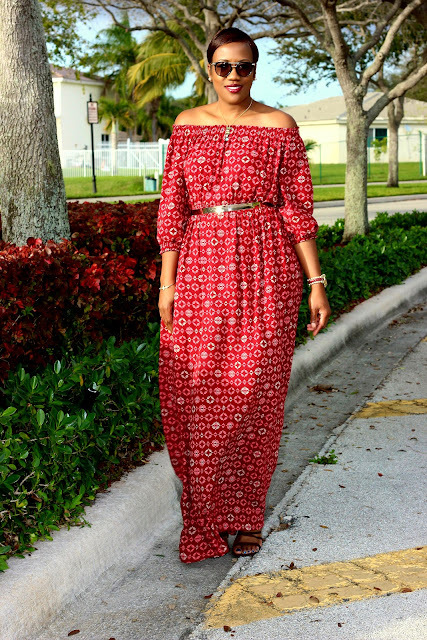 Living in Florida, our typical temperature during the month of January and February ranges from the low 50s to the high 70s which is perfect for this maxi dress. PHOTOS were captured in bright sunlight so fabric may appear lighter in color. Being pretty tall, more than the average size woman, (5 feet 10 inches) with a small upper body and a pear shape body type, it is very difficult to find ready to wear maxi dresses that can be worn with heels that fits just right. 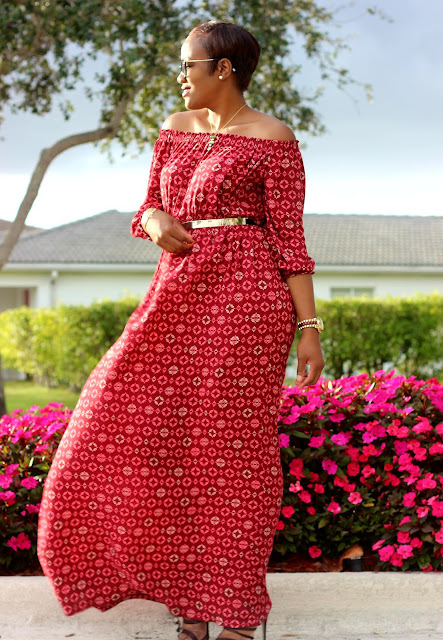 I wanted to hack one of my favorite summer dress pattern Simplicity 8124 and create an elastic waist maxi dress that was breezy, versatile and fun to wear. This dress is oh so perfect for a Sunday brunch, date night on Valentine's day, or even a Happy hour event. 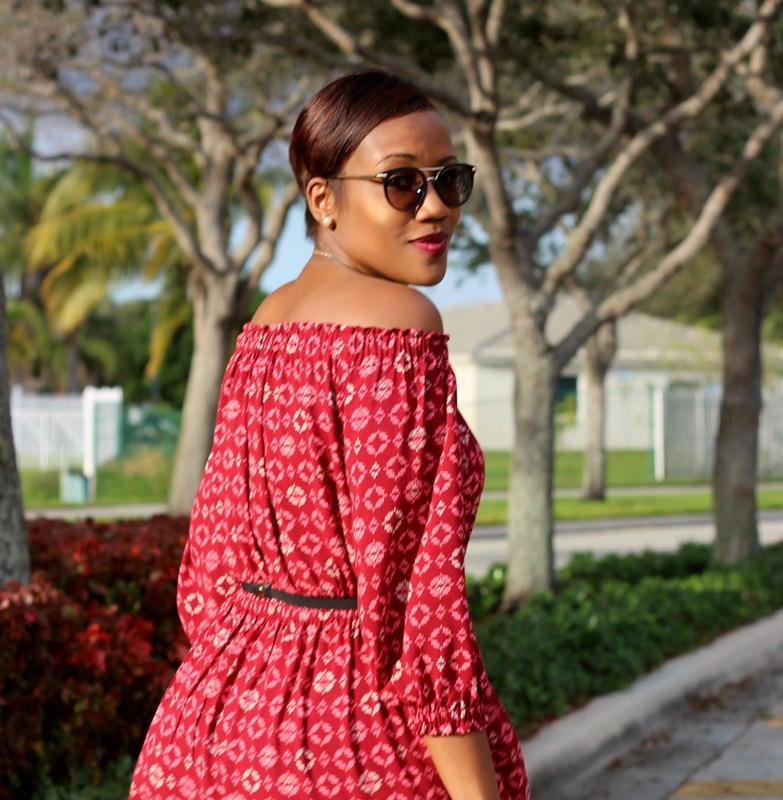 When I came across this Rayon Challis fabric (here), I knew it was perfect for a jumpsuit or maxi dress. 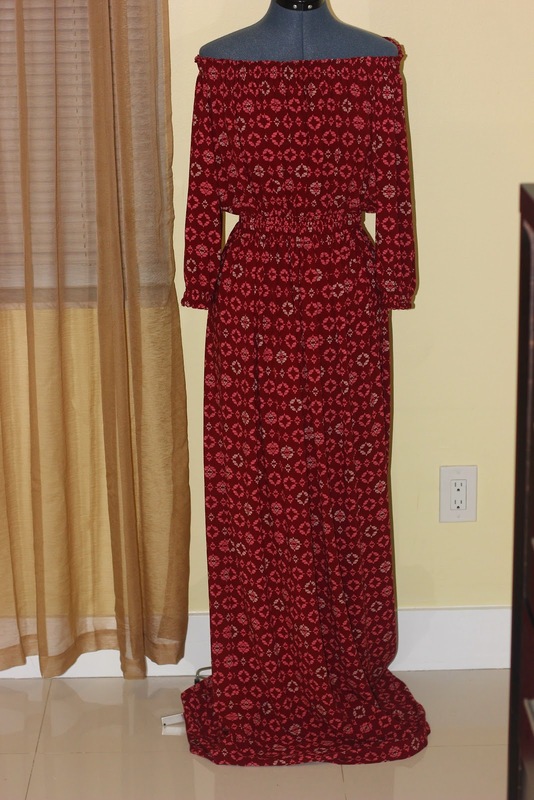 After receiving a VOTE via Instagram to create a maxi dress instead of a jumpsuit, I decided to go with a pattern that was an easy sew for a beginner. 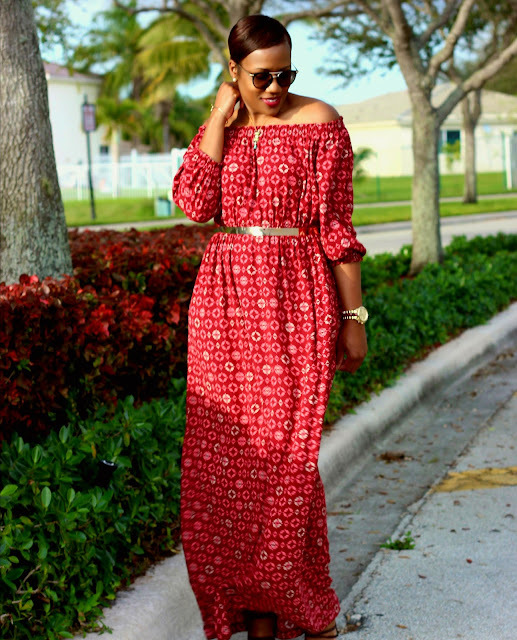 I had two maxi dress patterns in mind, a wrap dress or off the shoulder. Being that I am not a big fan of wrap dresses, I knew that this style was definitely a win. Cyntha Rowley's Simplicity off the shoulder dress pattern (8124) has 3 main pieces for the dress or top (bodice front, back and sleeves) and any beginner could simply create a self drafted pattern piece for the skirt. Opted to cut the XS based on my bust measurement. I measured slightly above my chest to my natural waist for the off the shoulder top bodice and added an extra inch to the bodice length to create the casing. I also measured the width of the top to create my skirt. (SIDE NOTE - The bodice top/dress front and back pattern pieces are cut on fold so the skirt front and back pieces (rectangular) were also cut on fold). I opted not to draft the skirt on paper but to use the width measurement of the top and cut directly on the fabric. I truly had no issues and created a 1 inch elastic waist casing after attaching the skirt and the bodice. I also added my own personal touch, a small paper bag casing for both the shoulder and sleeves. I am totally in love with the fit, length and silhouette of the light weight rayon challis fabric. 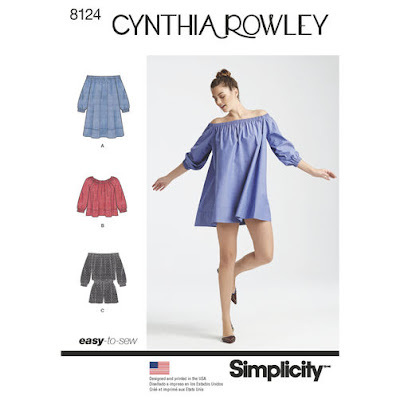 I am excited about some of the new McCalls patterns and can't wait to cut into the great pre-cut finds to create my Spring capsule that I plan to wear during my Spring Break vacation in March. Thank you so much for stopping by and don't forget to grab a few yards of this amazing Rayon Challis before its sold out! Photos Taken by my amazing 9 year old daughter Arielle. Don't forget to stop by my blog as well - Overdrive After 30! Wow, this is stunning on you! Great choice of pattern for this fabric. Arielle is one great photographer too! Thanks so much Ann. I love this fit too. My daughter and son are both amazing behind the camera. Just beautiful, I love a great maxi dress! Great choice on fabric and I like that you added your personal touches too! 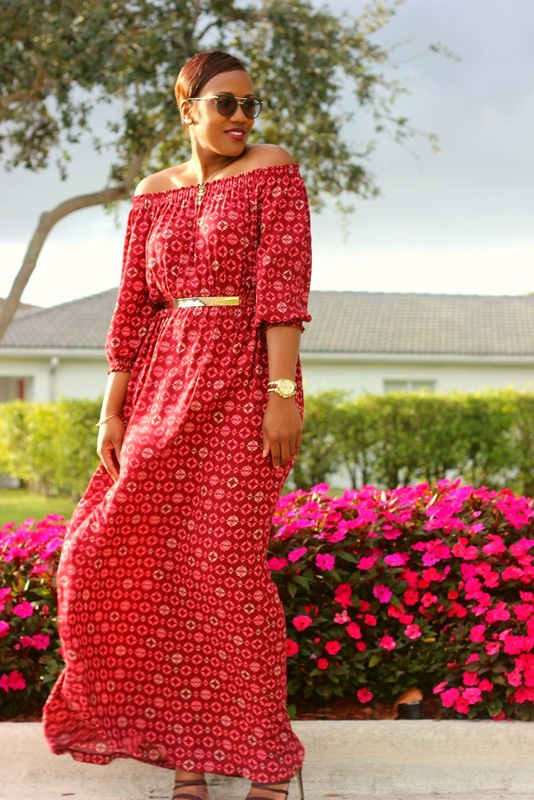 This is a beautiful maxi. Love what you did with it! Made by a Fabricista: It's Cape Time! Made by a Fabricista: Separates to mix and match!